How are you today? I hope you’re having a good week. As I said last time, we’re going to look at the fundamental differences in how train muscle strength and separately muscle power. In this post we’re going to look specifically at muscle strength I’ll also give you some exercises that you can try. The maximum amount of force one can generate during a specific movement at a specified velocity” (Knuttgen & Kraemer, 1987). 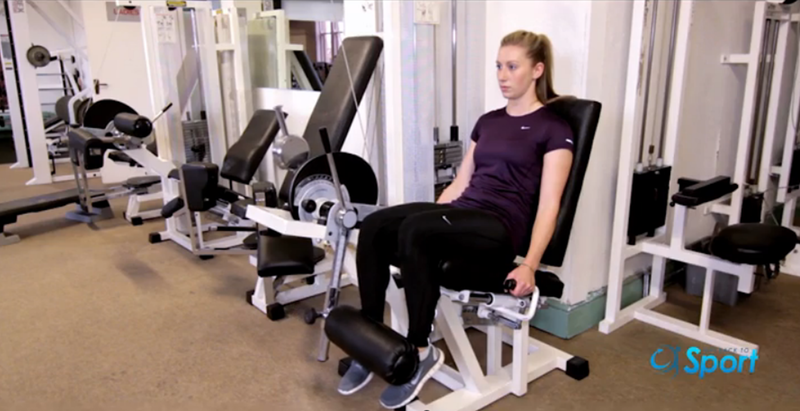 Muscle strength is important for injury prevention and is an important focus in the rehabilitation process following injury or surgery to help you Get Back To Sport safely and effectively. In the previous post (here) I said that you need a high load to really optimise your improvements in strength. Consequently, this means that you’ll only be able to lift it a small number of times. Let’s look at that specifically. Let’s pick the legs as an example. You want to increase the strength of your quadriceps (muscles at the front of the thigh), which are the muscles that are responsible for extending (straightening) your knee. What’s the first exercise that comes to mind (assuming we’re in a gym)? You select the weight that you want to lift, then you have to kick up hard against the pad at the front of your ankle to straighten your knee. Think about what happens on the way down…you don’t relax do you? You still need to contract your quadriceps to lower the weight so it doesn’t crash at the bottom. How much weight? How many reps? So we spoke about lifting a weight only a small number of times. How many? Well 3-5 repetitions maximum (RM). This means you select a weight that you can only lift 3-5 times, if you can do 6, 7, 8 then you’re out of the optimal zone for strength training. You will get some benefit, but not as much as if you increased the weight to keep you in the 3-5 RM zone. ……. Remember, you’re REALLY working hard here to lift the weight and when you stop it’ll be because you literally can not lift it, not because your muscles are burning (that’s a topic for another time). How much rest? How many sets? So you know what to do now. Simple eh? And, if you think about it, you monitor and control your progression as you improve … you’ll need to increase the weight as you get stronger! Can you think of any other exercises for this muscle…? Here are a few ideas: Dumbbell Lunges, Squats, Leg Press. These exercises are fantastic for the entire of the lower limb (and bum) – they also work your hamstrings, gluteals (bum) and calf muscles. You WILL get results if you WORK HARD and stick to these principles. Need some help? Get in touch and post your question here. Or visit the programmes and one-to-one page to get started.